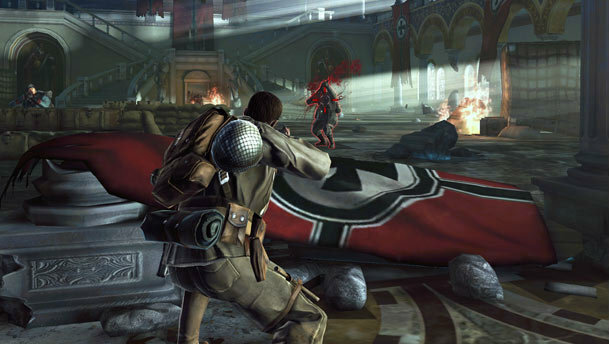 World War II has always been a popular setting for shooting based video games. A few years ago, most shooting games that came out had you storming Normandy Beach. In recent years, most shooters have moved on toward a more advanced and technological age in their games. Brothers in Arms 3: Sons of War brings you back to the 1940s to take down the Axis Powers. Brothers in Arms 3: Sons of War is a shooter that is set in World War II. You are a soldier in the war and you and a group of soldiers battle the Nazi Army in the various great battle settings in World War II. The game looks great graphically. The character models and the scenery are very crisp and the game looks better than most mobile games out there. The combat is fairly easy as well. You aim by swiping the screen and shoot by tapping a button in the corner. You are also allowed to move from different cover vantage points by movie the directional button on the screen. As you complete more missions you earn money to upgrade your weapons and you also unlock new soldiers with different skills and abilities that are also upgradable. This gives you different ways to play. Brothers in Arms 3 forces you to do a lot of waiting because a lot of the freemium aspects. The game is based on a stamina system. For each mission you play you use a piece of stamina. Using up all the stamina will force you to wait until you play again unless you want to pay. The currency system also forces you to wait after certain upgrades. The game is designed for you to either spend really money or wait for time bars to expire. Brothers in Arms 3: Sons of War is a very solid shooter that is bogged down by freemium costs. In the age of free mobile games, Brothers in Arms 3 is one that has a lot going for it, until you see the hidden agenda. The combat aspects and graphics are both very good, but the all the time bars really hold this game back.